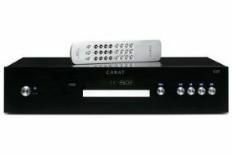 Carat C57 review | What Hi-Fi? Is there a tougher sector into which to launch a product at the moment? Last year's CD player Product of the Year, the Cyrus CD6se, swept all before it – and it costs exactly the same as this C57 from French manufacturer Carat. Talk about having your work cut out. Initial impressions are good enough. Stereo RCA and digital coaxial outputs are enough for most of your needs, and the Carat is nicely finished, chunky Perspex and moody blue lights to the fore. Buttons on the remote are a trifle small, but overall the C57 stacks up creditably against its rivals. Sound, though, is a much more qualified success. The Carat loads and reads Howlin' Wolf's Hidden Charms quickly and quietly – and serves up the raucous blues in rich, substantial gobbets. Low frequency impact is solid enough, though the C57 punches a little wearily, and Wolf's libidinous vocal carries plenty of character and detail. Harmonica and percussion rattle convincingly at the top of the frequency range, the Carat valuing body over brashness. There's a slight vagueness to the way the C57 organises a more complex recording like Radiohead's 2+2=5, though. The various instrumental threads are, relatively speaking, piled on top of one another rather and the C57 sacrifices some fluidity as a result. We're all for the sort of extrovert, heavyweight presentation that the C57 is shooting for, but there's a shortage of finesse on offer here – the Carat will happily pound the heavy bag all day but it's clueless where the speed ball is concerned. We can understand that some might find the looks compelling but, the market being what it is, you don't have to look very far to find a better player.